You are here: Home / Foot Care Blog / Foot Health & Hygiene / Does UV Light Kill Bacteria? How Does UV Light Kill Bacteria and Fungus? Millikin University chemistry professor Anne Rammelsberg tells the Scientific American, “Ultraviolet (UV) light kills cells by damaging their DNA. The light initiates a reaction between two molecules of thymine, one of the bases that make up DNA. The resulting thymine dimer is very stable, but repair of this kind of DNA damage — usually by excising or removing the two bases and filling in the gaps with new nucleotides — is fairly efficient. Even so, it breaks down when the damage is extensive.” She explains that the longer the exposure to UV light, the less likely it is that the microbes can repair themselves. What Does Science Say About UV Light? UV-C light has been used for decades in food, air and water purification and to sterilize laboratory equipment. More recently, it has been used in hospitals as the most effective method of sanitization. 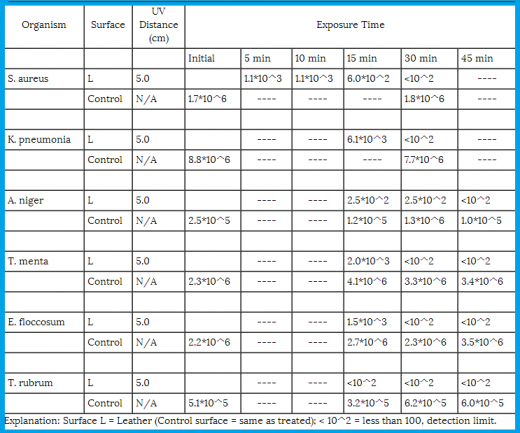 Infection Control Today cites a Duke and University of North Carolina study that demonstrates the effectiveness of UV-C light after just 45 minutes of treatment. Researchers saw the amount of Acinetobacter (which causes pneumonia and serious blood/urinary tract infections) drop from 55 colony-forming-units down to 1 — down 98.1%. Furthermore, VRE (which infects wounds and the bloodstream), the populations decreased 97.9%. With improved techniques, researchers could even target the difficult C. diff bacteria, known to causes intestinal upsets. What’s Wrong With Competing Products On The Market? You can see that the exposure time matters, so don’t believe product claims that you can just wave a magic wand and get rid of germs in a matter of seconds. We also found that plastic interferes with the transmission of UV light. We adapted our original protocol to use as little plastic as possible. As you can see, our design differs quite a bit from another similar device on the market. Why would you want only the toe area of the shoe cleaned? You need a UV shoe sanitizer that emits UV light throughout the entire shoe. As you probably know, humans should not come into direct contact with UV light. The same thing that happens to germ DNA can happen to our DNA if we’re not careful. So we’ve developed a number of safety measures to protect users from UV light exposure. For one, the device will only turn on if it is, in fact, inside a shoe. Secondly, the device automatically shuts off once it is done cycling and will not turn on unless the shoe bags surround it. We recommend SteriShoe UV shoe sanitizer for anyone who cares about foot health and hygiene — and especially for diabetics and anyone who has once suffered with athlete’s foot, toenail fungus or shoe odor. SteriShoe is a powerful tool for helping to prevent the recurrence of bacteria and fungus-related foot conditions.